Lesley Manville and Jeremy Irons in the current production at the Wallis (the U.K.’s Bristol Old Vic). Photo credit: Hugo Glendinning. Now playing at the Wallis in Beverly Hills for a limited engagement (until July 1, 2018) is a revival of Eugene O’Neill’s Long Day’s Journey Into Night. This production originated at the U.K.’s Bristol Old Vic in 2016. The following is guest article by Neal Weaver that traces the theatrical history of the Pulitzer prize-winning play. I was still a student in the theatre department at Northwestern University in the 1950s when the publication on Eugene O’Neill’s Long Day’s Journey into Night was announced. Every day after my last class, I hurried to Kroch’s bookstore to see if they had received it yet. And when at last I saw it on the shelf, in the now familiar Yale University Press edition, with the portrait of O’Neill on the cover, it was terribly exciting. I purchased it, and rushed home to read it. It had been announced that the Royal Swedish Dramatic Theatre would produce the world premiere production of the play, and I longed to see it. But there was no way I could manage a trip to Sweden. But years later, in the 1960s, when I was living in NYC, it was announced that the Royal Dramatic Theatre was coming to New York. They were reviving the original production of Long Day’s Journey, with all of the original cast, plus productions of Strindberg’s The Father and Miss Julie. So I rushed to acquire tickets for all three productions. And since they would be performed in Swedish, I set about reading and refamiliarizing myself with all three plays. There were three chaise longues on the set, and in the last act, when the father and both sons had drunk themselves into a stupor, each fell, unconscious, on one of the chaises. They were like a fallen Stone Henge. And into their midst, Tidblad came, carrying that wedding dress. Her performance was a revelation. She was the only Mary I ever saw who actually played the arthritis which has supposedly crippled her hands and made her unable to play the piano. Her hands were like distorted claws, and when she grew angry at Jamie, and wanted to pound her fist, she was unable to do so, and pounded with the back of her wrist. The whole production was totally emotionally full, and watching through opera glasses, I could see that all of the actors had tears welling into their eyes almost throughout. Tidblad was in her 70s at the time, but she also played Miss Julie, acting the youth gloriously: She entered by vaulting in the window, and the only sign of age was the veins in the backs of her hands. The third play, The Father, was an old, lackluster production, though it was directed Victor Sjostrom (known as Victor Seastrom in his Hollywood days). Perhaps it had been weakened and diluted over time. Lars Hanson had trouble remembering his lines, and the wife was not good. It had one brilliant scene, of the old nurse reading her Bible and drinking her tea. It was a bit of text book European character acting, as brilliant as it was moving. During the company’s time in NYC, the major actors visited the acting sessions at The Actors Studio, leading to another display of just how grudging Lee Strasberg could be in talking about the work of other theatre folk. I remember he said to them, “If envy is admiration, then we admire you.” I thought it a mean-spirited, graceless, and ungracious remark. They were simply brilliant and I admired them enormously. 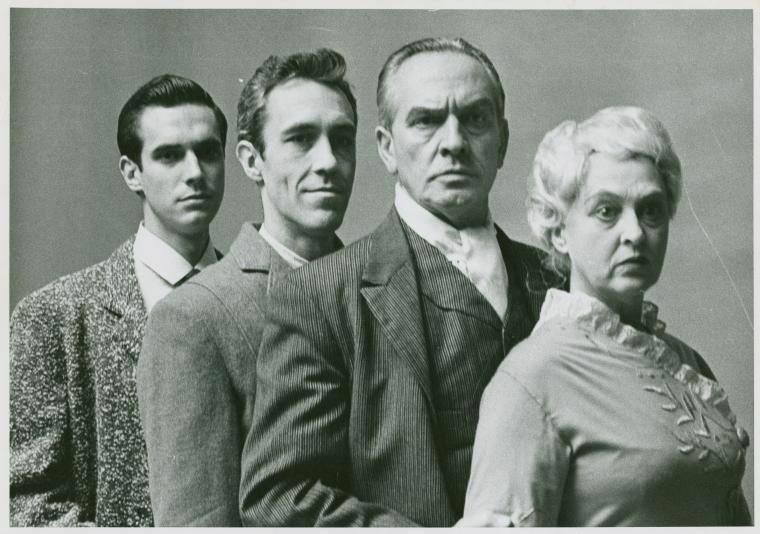 Publicity photo of Bradford Dillman, Jason Robards, Jr., Fredric March, and Florence Eldridge in the original stage production Long Day’s Journey Into Night. When I made my move to NYC in 1957, after my final year at Northwestern and a Season of summer stock in Eagles Mere, Pennsylvania, the original Broadway production of Long Day’s Journey into Night was still running, with Fredric March as James, his wife Florence Eldridge as Mary, Jason Robards, Jr., as Jamie, and Bradford Dillman as Edmund. It was the first show I wanted to see, and I bought a ticket for a matinee. It was an exciting production, mostly due to a brilliant performance by Robards. Eldridge was just plain hammy, charging round the stage with arms extended, bellowing, “I’ve lost something!” She was as obvious as Inga Tidblad was subtle. March was also a bit hammy, but since he was playing an aging, old-school, star actor, it worked for him and the character. Because I was a bit snobbish about movie actors, I tended to ignore Dillman. And it seemed to me that all the other actors were working to compensate for the weaknesses of his performances. There was one brilliant and memorable moment in the last act, due largely to an accident. In the long drinking scene between Jamie and Edmund, their mutual hostility breaks out, and they lash out hurtfully at each other. But in that moment, they accidentally broke a glass, and were concerned lest somebody get cut. Robards wandered round the set, looking for tools to clean up the glass, but could find only a wastebasket. They continued the scene, while carefully picking up the shards of glass, out for blood in their mutual hostility, yet each full of concern for his fellow actor. It became richly layered, with surface malice and hatred, and a deep love underneath. After the performance ended, I went to join my friend Brett Harvey and her friend Tammy Allen at an Irish bar round the corner on 8th Avenue. I didn’t know that Tammy was going with Robards at the time, so I was flabbergasted when he entered the bar, crossed to our table, and sat down opposite me. Having just seen him deliver a superlative performance, I was wowed to be sitting across from him. Shortly after that Actors Equity sponsored a series of seminars on topics ranging from Eugene O’Neill to Musical comedy. The O’Neill seminar was held on the set of Long Day’s Journey at the Helen Hayes Theatre (now demolished) though afterwards a much smaller theatre was called the Helen Hayes. Fredric March, very much in character as James O’Neill, welcomed us to his home. And among the other features, Jason Robards, Jr. delivered Hickey’s monologue about the iceman from The Iceman Cometh. And even out of context, he delivered it brilliantly, which was some consolation to me for not having seen that production, but I was able to see the tv production on tape, with Robards, Robert Redford and a host of other great character actors. As I was leaving the theatre, I was approached by a strange elfin little old men. He said, “Marks is the Name. Joe E. Marks.” He hadn’t been able to attend the seminar, and asked what it was like. I recognized him at the actor who had played Smee in the Vernonica Lake Peter Pan on tour. It was startling and sort of exciting to meet Smee on West 46th Street. I answered him as well as I could, and we went our separate ways. Later Robards would play James, in a production that also starred Zoe Caldwell as Mary, and Michael; Moriarty as Edmund. I don’t remember a great deal about that production. But Moriarty took an interesting slant on Edmund, playing a man who desperately wanted to be a real poet, but knew he wasn’t one. It made for a rather stunted, internalized Edmund, which I thought was interesting. But the audience hated him, and he was booed. It was also that production that made me realize how exhaustingly long that play can be. When Caldwell came on in the last scene, carrying that wedding gown, my heart sank, as I knew there was still another 20 minutes to go. 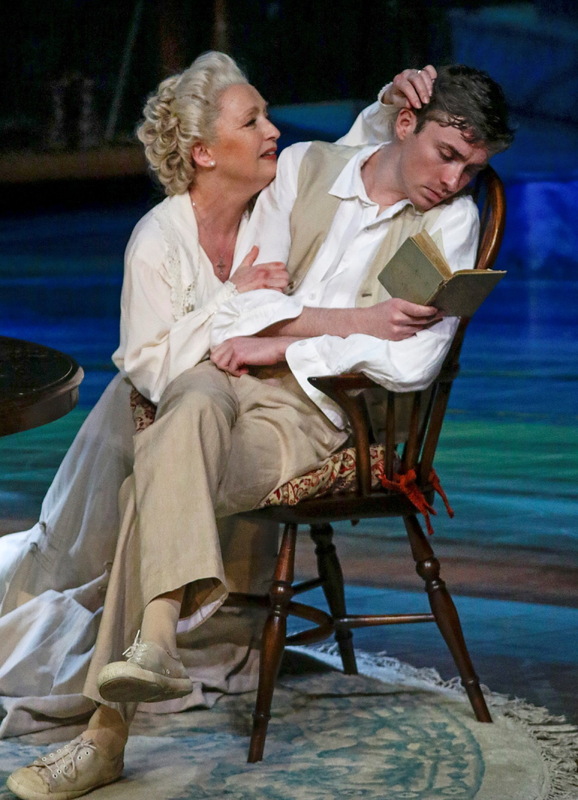 Lesley Manville and Matthew Beard in Long Day’s Journey Into Night. Photo by Hugo Glendinning. 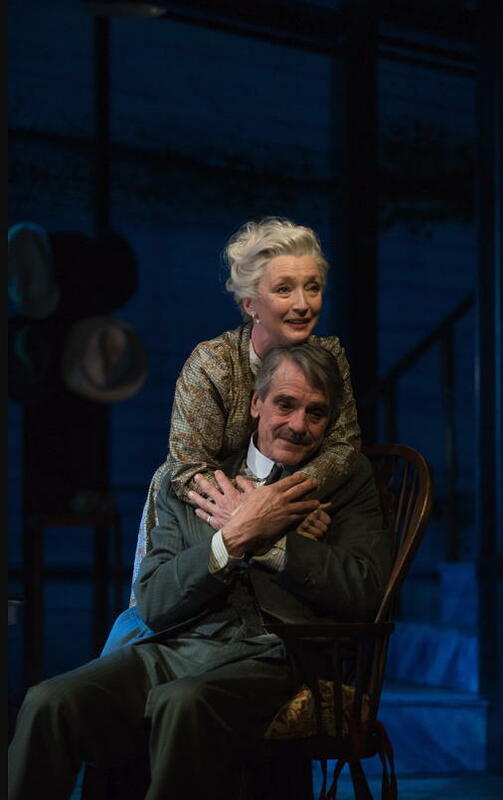 I was also privileged recently to see the Bristol Old Vic production – now playing at the Wallis in Beverly Hills – with Jeremy Irons as James, Lesley Manville as Mary, Matthew Beard as Edmund, Rory Keenan as Jamie, and Jessica Regan as the Irish maid, Cathleen. The performances were all wonderful, and director Richard Eyre had a real knack for physicalizing the underlying emotions, making it the most dynamic production I’ve seen. Matthew Beard was certainly the most memorable Edmund since Jarl Julle. And Manville’s Mary was a power-house, as a nagging, complaining addict, and a desperate trial to her family, who would have been insufferable if she had not been so clearly desperate. And she was well-matched by Jeremy Irons as James. After watching the play once again, in a sterling production, it was easy to understand the unending tragedy of O’Neill’s life, which also took its toll on his wives and children. Both his sons, Shane and Eugene Jr. took their own lives. And he disowned his daughter Oona when she married Charlie Chaplin. 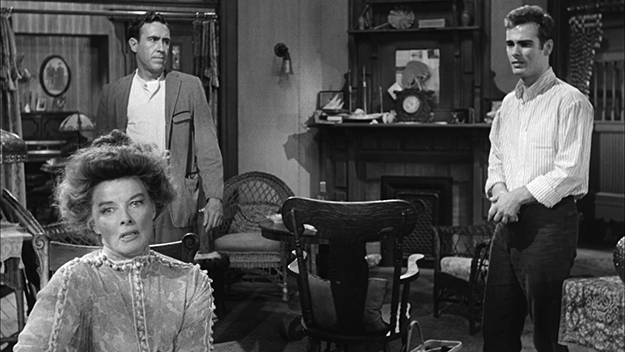 Katharine Hepburn, with Ralph Richardson (L) and Dean Stockwell (R) in Long Day’s Journey into Night, the 1962 screen adaptation of the Eugene O’Neill play, directed by Sidney Lumet.